Sometimes I wish spring time could take much longer than the couple of weeks in March, April and May. Both the Keukenhof as the tulip fields look wonderful. When you drive around the flower fields you will notice that the daffodils are gone and the hyacinths are at their peak or just over their peak. It won’t take long before we have to wait to next year for the wonderful smell of the hyacinths. The early tulips are gone and they are headed last week. But don’t you worry there are lots of tulip fields in bloom or about to bloom in the next week. At Keukenhof every thing looks so beautiful in bloom. Here you can still see the daffodils and hyacinths, but also the beautiful rhododendrons in bloom. At a couple of locations in the park the have build a stream of flowers in all sorts and colors. Make sure you visit one of them because it is a lovely sight. Around the bulb statue the hyacinths are replaced by tulips. The indoor exhibition might be there for just one week before it will be replaced for another exhibition. About 20% of the tulips is still in bloom but the rest is over their peak. For the next week I expect to see much more tulip fields in bloom. When you are visiting this week make sure you drive around by bike or by car (and don’t forget to bring your camera). Inside Keukenhof you will find lots of flowers in bloom. If you are doubting when to visit, now is a great moment to do so. 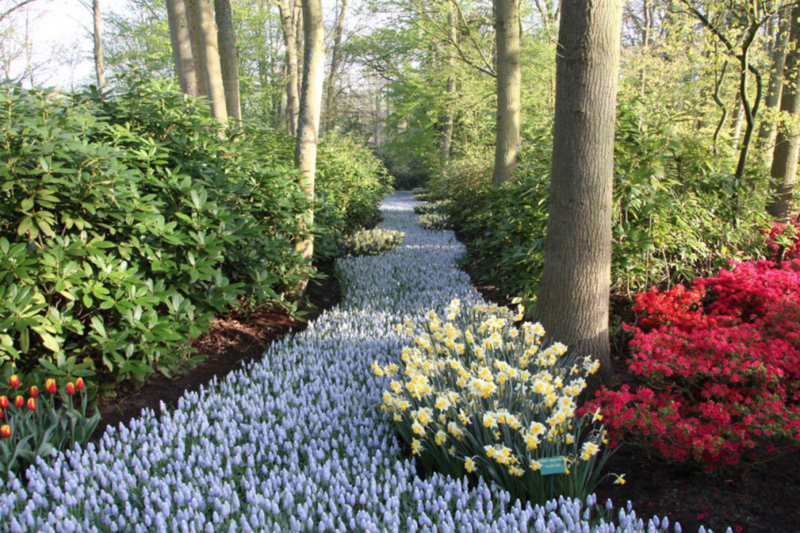 Wondering what the flower fields and Keukenhof look like now? Have a look at our photo stream. I notice in your latest photos, which are beautiful by the way, there is no one in the park. What time of day were you there that it would be so empty? I assume this time of year the park would be crowded at all times. Is there a time I can visit that will also be that empty? Will there be any luck to see nice colourful and long tulip fields during 22-25 April around Lisse? or it will be late due to early spring? The condition of flower fields in Lisse and north Holland will be same during the 22-25 April? If you want to see flower in the fields it is better to travel sooner than later. Not all the fields are in bloom but due to the warm weather the fields are headed quicker than last years. The conditions are the same around Lisse, top of North Holland and around Emmeloord. It is too close together to have different conditions.